Oklahoma President David Boren said he and fellow Big 12 presidents are in a "fact-finding" stage rather than a "decision-making" stage after Thursday's Board of Regents meeting. 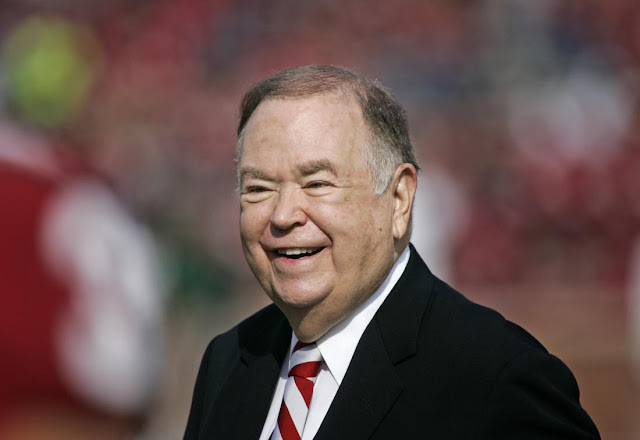 "We're inching along, but I don't know exactly how soon we can come to these conclusions," Boren said in response to questions about creating a conference network and conference expansion. Rather than discuss expansion directly, Boren spoke with reporters about the possibility of adding a Big 12 network. More, via Tulsa World: David Boren said OU officials are "totally unified with regard to this process." That was a reference to the news Monday, when Boren and OU Board of Regents chair Max Weitzenhoffer released evening statements saying they were on the same page about the Big 12 Conference and OU’s place in it. That came after a report earlier in the day that said Weitzenhoffer questioned Boren's call for Big 12 expansion.